An instance of SCP-3153 in containment. Special Containment Procedures: SCP-3153 is to be kept in an artificial habitat appropriate for centipedes in Site-64 as specified in construction sheet 3153-A. The interior of the habitat is to be decorated like a non-specific major metropolitan area, with visual and audio props meant to convince SCP-3153 that they are still living in the outside world. In addition to the normal care required by centipedes, SCP-3153 is to be sustained through a weekly social interaction session with one to five D-Class personnel, or employees of GoI-466 (Wilson's Wildlife Solutions)1 that have Level 2 Site Wide Clearance and wish to apply themselves2. Those who wish to sustain instances of SCP-3153 through social interaction must first pass through psychological evaluation meant to detect tendencies toward excessive emotional attachment. Each session is to last a maximum of 1 hour, and to be monitored closely by Researchers for the eventual biological and behavioral alterations in SCP-3153. All significant alterations are to be registered for posterity in order to gain a better understanding of how the genetics of SCP-3153 operate. Civilians who come into contact with wild instances of SCP-3153 are to be given Class B amnestics, and the instances are to be recovered by GoI-466. 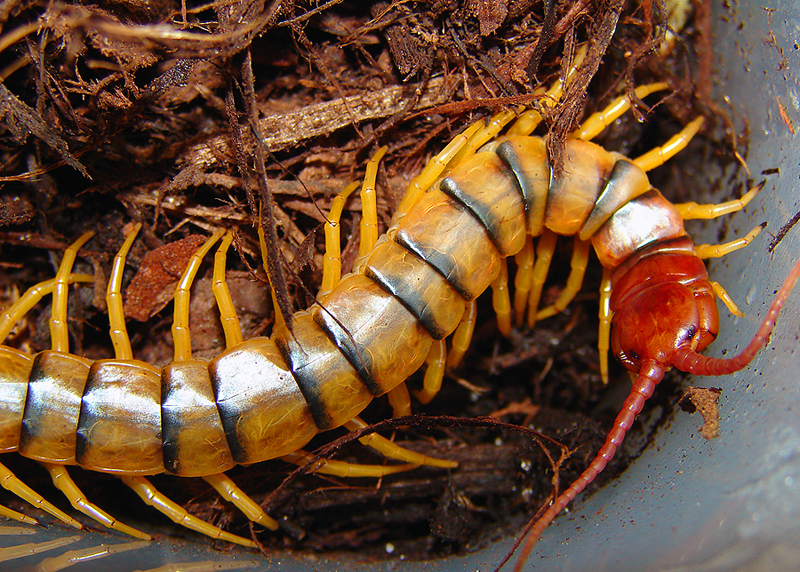 Description: SCP-3153 refers to a species of organisms outwardly resembling the Scolopendra polymorpha species of centipedes, which are native to northwestern Oregon. They measure approximately 1.76 m in length and weigh an average of 82 kg. Beyond their initial chitinous carapace, instances of SCP-3153 are an undifferentiated mass of biological tissue similar in function to totipotent stem cells, albeit much faster in how they act. Instances of SCP-3153 are capable of forming new organs, limbs and tissues from this mass, but this is dependent on how much they interact with and form significant emotional bonds with human subjects. The types of adaptations that instances of SCP-3153 are capable of forming seem to be limited to crude attempts at mimicking and pleasing the human subjects they are bonding with. Initially, instances of SCP-3153 operate with sophisticated animal intelligence. Methods of assistance include bringing small objects that a human subject will need in the morning, or swarming over perceived intruders to the subject's home. Methods of mimicry include eating the same foods as the subject and nesting on their bed. Of note is that as long as the human subject the instances are bonding with has not reciprocated their advances in a significant fashion, the instances are incredibly persistent and will regenerate from grievous injuries in a matter of seconds. No matter how aggressive the human subject becomes, the instances will not fight back, and display a timid and forgiving behavior toward the subject. These actions persist until the human subject attempts to communicate with the instances in a friendly manner, leaves a small offering of food for them or otherwise attempts to reciprocate the bonding. During this time, SCP-3153 has been known to shed excess quantities of quasi-human body parts and biological tissues from their mass of stem-like cells, apparently in an effort to ease mimicry of and socializing with the human subject. However, since their understanding of human nature at this point is still crude, these shed materials are almost invariably malformed and unstable, but rarely represent any danger. Gradually, SCP-3153 instances develop recognition of human facial expressions. They occasionally attempt to stand upright and embrace the subject in a manner similar to a hug, and generally stay close to and protect them. Instances will also develop a decent understanding of language and technology, as well as the anatomical adaptations to use them, albeit not as effectively as a human. Over time, the instances will accumulate more and more adaptations for the purposes of becoming more like the human subject they are bonding with. However, the instances are incapable of accurately replicating the human form or behavior. The quantity of shed materials tends to increase at this point. The shed materials remain harmless but may attract infestations of non-anomalous pests if left unchecked. Instances who have been successfully instructed on how to reduce their shedding obey in 92% of cases. Of note is after receiving such instructions, 46% of instances showed of their own initiative the capacity to reshape their shed biological material into edible versions, invariably presenting such items to their human subjects as apparent gifts. Refusal of such edible items was observed to cause a considerable sadness response in SCP-3153 instances. Further research into the level of intelligence and capability of biological tissue generation of SCP-3153 instances is pending. Evidence indicates that instances of SCP-3153 do not produce any mind-affecting anomalies, and that any interactions that arise between them and their associated human subjects are to be treated as mundane. So far, 68% of human subjects have successfully completed the bonding process, with an estimated 21% increase in overall productivity. Use of SCP-3153 instances and similar anomalies for therapeutic purposes has been proposed by Dr. █████ in the research paper "Humane Pests And Pestilent Humans: On The Emergence Of Non-Conventional Friendships Between Homo Sapiens And Anomalous Arthropods". 1. Involved in the containment of SCP-3466. 2. Along with Sarah Gardner, to which instance SCP-3153-01 is bonded.